Below is the florists buys of the week. Alternatively click on one of the departments at the top of the screen to see all the products. Fresh Flower for birthdays, anniversaries and gifts. Fresh flowers are great for gifts such as birthdays and anniversaries, new home and new baby gifts or simply just to say thank you. Having your flowers delivered is always extra special, so why not order online today and have your flowers delivered by your local florist. All our flowers are delivered with care instructions so the person receiving knows how best to look after them. We also put a hand written card with every order that has a personal message of your choice. We do fresh flower deliveries to St.Andrews, Cupar, Newburgh and other towns and villages in Fife and Perthshire on a daily basis. 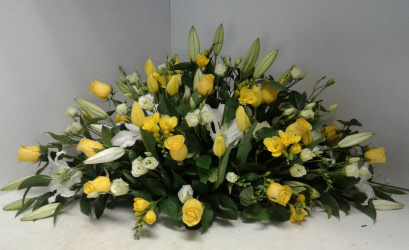 Funeral Flowers can be delivered to all local undertakers in North East Fife and Perthshire. Whether it be a wreath, spray, cross or any other funeral tribute Flowers by Canatara can make it up and deliver your floral tribute direct to the funeral undertaker. We do daily flower deliveries to St.Andrews, Cupar, Newburgh and other towns and villages in Fife and Perthshire. Funerals can be a difficult time so at Flowers by Canatara we take care of everything for you. Daily flower deliveries to all towns and villages across North East Fife including the main towns such as Cupar and St.Andrews and all other villages and towns. At Flowers by Canatara we can do same day flower deliveries throughout North East Fife and Perthshire if ordered by 1pm.